Way back in 1981, long before Goldsea or even a world-wide web existed, I came across Jade magazine on a newsstand somewhere in Los Angeles. It was a glossy four-color quarterly that had been published by a Chinese American since 1979. I was delighted. Here was an English-language medium published in the United States that focused on Asian Americans. That fact alone made me buy a copy and read it from cover to cover. Instead of throwing it away I kept it as tangible evidence of the existence of an Asian American consciousness. Not a Chinese or a Japanese or a Korean American consciousness but a consciousness of being an English-speaking, acculturated Asian in America. For too many years the paucity of media coverage of Asian Americans had made me wonder whether my own racially-tinged perceptions were merely the product of a self-absorbed imagination. Here was evidence that it was not. AsiAm (left) split into Transpacific and Face in 1991 in order to cater to male and female audiences. Over the next 130 years several dozen newspapers were published in-language for Japanese, Chinese, Korean and Filipino communities scattered across the western states. Chinese papers like World Journal were entirely in Chinese. 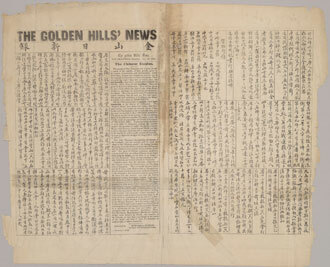 Some of the Japanese papers, catering to a growing number of second-generation readers, were bi-lingual, like Pacific Citizen, Nichi Bei Times in San Francisco, Rafu Shimpo in Los Angeles, or even entirely in English, like the The Heart Mountain Sentinel published for Japanese American internees at Heart Mountain Relocation Camp in northwestern Wyoming during the heartbreaking years of 1941- 1945. What distinguished Jade was that it was the first four-color magazine that sought to address a pan-Asian audience entirely in English. Unfortunately, it managed only spotty distribution and no major advertising support. It published its final issue in 1983 after putting out a dozen issues over a four-year span. My own personal involvement with Asian American media began a few years later with AsiAm magazine. It debuted in October of 1986. Its publisher and editor was a young Korean American lawyer based out of a Wilshire Boulevard highrise in Los Angeles. AsiAm was a more ambitious undertaking than Jade on several levels. It was a monthly, with more pages, most of them in color. AsiAm secured national distribution in book chains like Crown Books, Waldenbooks, Barnes & Noble and Borders. Eventually it entered mainstream and Asian supermarket chains and newsstands in every top metro area, making it the first truly national magazine for Asian Americans. From the outset AsiAm stirred up controversy with its bold style and attitude. Unlike Jade, which focused on traditional cultural topics like food and art, AsiAm was in-your-face in celebrating the most successful Asians in American business, technology and the professions. And unlike the various Asian community tabloids which tended to dwell on the problems facing underprivileged immigrant Asians, AsiAm featured long “think” pieces on the growing influence of Japan, Korea, Taiwan and China, as well as shorter essays on the Asian American experience. Some of those pieces were written by me, to reveal my bias on this score. Many of those identity pieces are archived here on Goldsea.com. The AsiAm features that seemed to get the most attention were the lavish 12-page 4-color fashion spreads shot in upscale hotels and restaurants. Unlike every other fashion spread ever presented up to that time in the American media, these centered on Asian American male and female models, with a blonde or two draped on the arm of some of the male models. The idea of putting Asian men at the center of photo spreads that portrayed them in a glamorous, sexually dominant light was completely new, and it seemed to discomfit some Asian Americans even more than the reverse images so pervasive in the mainstream press. AsiAm’s fashion photos represented the first bold step toward de-ghettoizing the image of Asian American men. But Asian community greybeards complained that AsiAm was painting a picture of Asian American life focused too much on material success and style instead of the social problems facing Asian Americans. Not surprisingly, AsiAm’s very existence threatened those who had built careers by complaining about the disadvantages handicapping Asian Americans. AsiAm’s vision of Asian Americans as enterprising and self-confident won over major advertisers like BMW, Mercedes-Benz, Cadillac, Bally Shoes and Chivas Regal — drawing even more hostile attention from old-line community activists who complained that AsiAm had “sold out” the community for profits. The reality was quite different. Because of my involvement with AsiAm and its successors, I knew that even with its impressive advertising and distribution, revenues struggled to match the six-figure monthly cost of publishing a glossy magazine with national distribution. To meet expenses publisher Tom Kagy (a Korean American who had taken on his stepfather’s surname as a child) was forced to continue his law practice for several years after starting up AsiAm. In the fall of 1987, about a year after AsiAm began publication, a Chinese American restaurateur and a Chinese American dentist joined forces to launch Rice magazine, a glossy with a more sedate, less brash vision of Asian American life. I asked its associate publisher Kenyon Chan about the thinking behind what seemed to me a stereotypical name. He explained that eating rice is the one common denominator shared by Asian Americans. Those who had criticized AsiAm found Rice more acceptable. Rice achieved a level of distribution and advertising that began to rival AsiAm’s before financial pressures forced it to fold in 1989. Meanwhile AsiAm decided that its ad sales efforts were hampered by the need to cater simultaneously to both male and female audiences. The publisher solved it by splitting AsiAm into two titles beginning in 1991. Transpacific would present Asian American success stories, think pieces, and the Asian American experience and identity while Face would focus on beauty, fashion and lifestyle articles for Asian American women. Under the creative direction and editorship of Shi Kagy Face was able to land prestigious advertisers like Estée Lauder, Lancome, Clinique, Chanel and Tiffany. By attaining the editorial quality needed to support top-flight image advertising, Transpacific and Face became milestones in the evolution of the Asian American consciousness. Not only did advertising make them financially viable, it validated Asian Americans as an economically successful and culturally attractive population segment. Their success in attracting quality advertising also opened them to the criticism of having sold out to mainstream sensibilities, and simultaneously, encouraged competing publishers to enter the scene, further stimulating the evolution of a pan-Asian American consciousness. "Their success in attracting quality advertising also opened them to the criticism of having sold out to mainstream sensibilities, and simultaneously, encouraged competing publishers to enter the scene, further stimulating the evolution of a pan-Asian American consciousness."